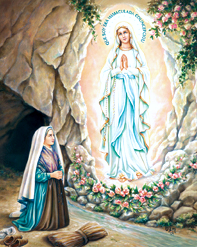 The first of the eighteen apparitions of the Blessed Virgin Mary to the humble Bernadette Soubirous took place at Lourdes on February 11, 1858. On March 25th, when Bernadette asked the beautiful Lady Her name, She replied: I am the Immaculate Conception. The Church for long centuries had believed in Her Immaculate Conception, Her exemption from every trace of the original sin which through Adam, our first and common father, separated man from his God. It was never proclaimed a dogma, however, until 1854. Mary Herself, in 1830, had asked of a Vincentian Sister at the Rue du Bac in Paris, that a medal be struck bearing Her likeness and the inscription: O Mary, conceived without sin, pray for us who have recourse to Thee. Through the Lourdes Apparitions, the devotion of persons in all parts of the world to the Immaculate Mother of God has been wonderfully spread, and countless miracles have been wrought everywhere through Her intercession. The Virgin Mother of God is truly the chosen Messenger of God to these latter times, which are entrusted to Her, the chosen vessel of the unique privilege of exemption from original sin. Only with Her assistance will the dangers of the present world situation be averted. As She has done since 1858 in many places, at Lourdes, too, She gave us Her peace plan for the world, through Saint Bernadette: Prayer and Penance, to save souls.